The neural networks we’ve built so far have had a relatively simple structure. The input to each layer is fully connected to the output of the previous layer. For this reason, these layers are commonly called fully connected layers. 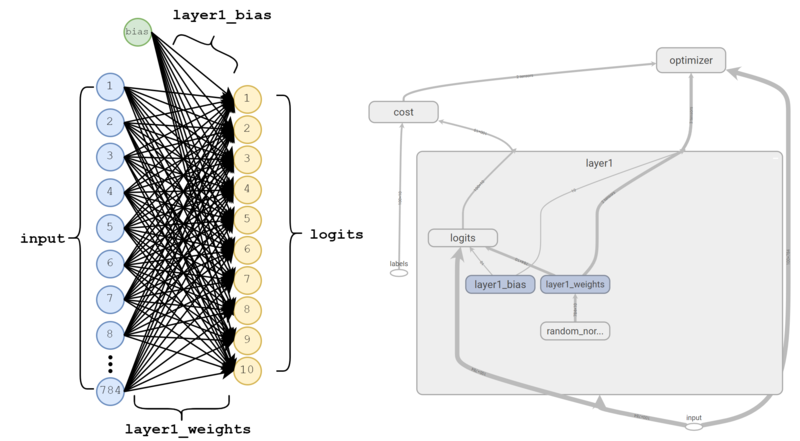 Two fully connected layers in a neural network. This has been mathematically convenient because we’ve been able to represent each layer’s output as a matrix multiplication of the previous layer’s output (a vector) with the current layer’s weights. Translational Invariance – A fancy phrase for “A network trained to recognize cats should recognize cats equally well if they’re in the top left of the picture or the bottom right of the picture”. If we move the cat around the image, we should still expect to recognize it. Translational invariance suggests we should recognize objects regardless of where they’re located in the image. Local Connectivity – This means that we should take advantage of features within a certain area of the image. Remember that in previous posts we treated the input as a single row of pixels. This meant that local features (e.g. edges, curves, loops) are very hard for our networks to identify and pick out. Ideally our network should try to identify patterns than occur within local regions of the image and use these patterns to influence its predictions. Today we’re going look at one of the most successful classes of neural networks: Convolutional Neural Networks. Convolutional Neural Networks have been shown to give us both translational invariance and local connectivity. The building block of a convolutional neural network is a convolutional filter. It is a square (typically 3x3) set of weights. The convolutional filter looks at pieces of the input of the same shape. As it does, it takes the dot product of the weights with the input and saves the result in the output. The convolutional filter is dragged along the entire input until the entire input has been covered. Below is a simple example with a (random) 5x5 input and a (random) 3x3 filter. So why is this useful? Consider the following examples with a vertical line in the input and a 3×3 filter with weights chosen specifically to detect vertical edges. Vertical edge detection from light-to-dark. Vertical edge detection from dark-to-light. We can see that with hand-picked weights, we’re able to generate patterns in the output. In this example, light-to-dark transitions produce large positive values while dark-to-light transitions produce large negative values. Where there is no change at all, the filter will simply produce zeroes. While we’ve chosen the above filter’s weights manually, it turns out that training our network via gradient descent ends up selecting very good weights for these filters. As we add more convolutional layers to our network they begin to be able to recognize more abstract concepts such as faces, whiskers, wheels etc. You may have noticed that the output above has a smaller width and height than the original input. If we pass this output to another convolutional layer it will continue to shrink. Without dealing with this shrinkage, we’ll find that this puts an upper bound on how many convolutional layers we can have in our network. The most common way to deal with this shrinkage is to pad the entire image with enough zeroes such that the output shape will have the same width and height as the input. This is called SAME padding and allows us to continue passing the output to more and more convolutional layers without worrying about shrinking width and height dimensions. Below we take our first example (5×5 input) and pad it with zeroes to make sure the output is still 5×5. A 5x5 input padded with zeroes to generate a 5x5 output. VALID padding does not pad the input with anything. It probably would have made more sense to call it NO padding or NONE padding. VALID padding results in shrinkage in width and height. So far we’ve been moving the convolutional filter across the input one pixel at a time. In other words, we’ve been using a stride=1. Stride refers to the number of pixels we move the filter in the width and height dimension every time we compute a dot-product. The most common stride value is stride=1, but certain algorithms require larger stride values. Below is an example using stride=2. Notice that larger stride values result in larger decreases in output height and width. Occasionally this is desirable near the start of a network when working with larger images. Smaller input width and height can make the calculations more manageable in deeper layers of the network. In our previous examples we’ve been working with inputs that have variable height and width dimensions, but no depth dimension. However, some images (e.g. RGB) have depth, and we need some way to account for it. The key is to extend our filter’s depth dimension to match the depth dimension of the input. Convolution over an input with a depth of 2 using a single filter with a depth of 2. Above we have an input of size 5x5x2 and a single filter of size 3x3x2. The filter is dragged across the input and once again the dot product is taken at each point. The difference here is that there are 18 values being added up at each point (9 from each depth of the input image). The result is an output with a single depth dimension. We can also control the output depth by stacking up multiple convolutional filters. Each filter acts independently of one another while computing its results and then all of the results are stacked together to create the ouptut. This means we can control output depth simply by adding or removing convolutional filters. Two convolutional filters result in a output depth of two. It’s very important to note that there are two distinct convolutional filters above. 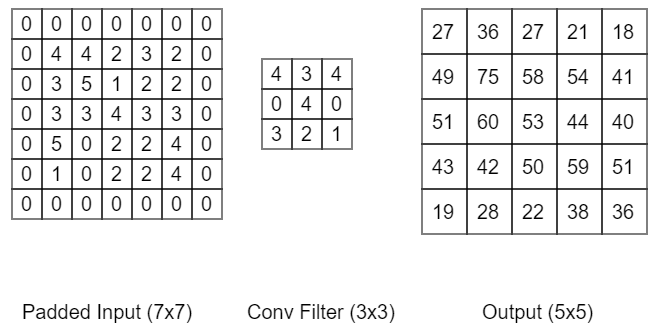 The weights of each convolutional filter are distinct from the weights of the other convolutional filter. Each of these two filters has a shape of 3x3x2. If we wanted to get a deeper output, we could continue stacking more of these 3x3x2 filters on top of one another. Imagine for a moment that we stacked four convolutional filters on top of one another, each with a set of weights trained to recognize different patterns. One might recognize horizontal edges, one might recognize vertical edges, one might recognize diagonal edges from top-left to bottom-right and one might recognize diagonal edges from bottom-left to top-right. Each of these filters would produce one depth layer of the output with values where their respective edges were detected. Later layers of our network would be able to act on this information and build up even more complex representations of the input. There is a lot to process in this post. We’ve seen a brand new building block for our neural networks called the convolutional filter and a myriad of ways to customize it. In the next post we’ll implement our first convolutional neural network in TensorFlow and try to better understand practical ways to use this building block to build a better digit recognizer. 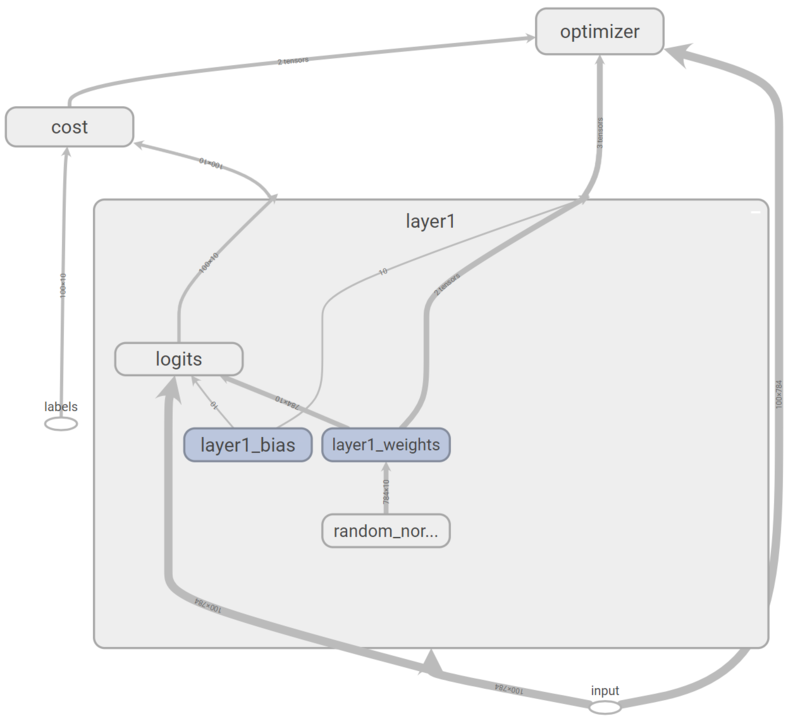 When we wish to evaluate optimizer and cost, TensorFlow first runs all the operations defined by the previous nodes, then calculates the required results and returns them. 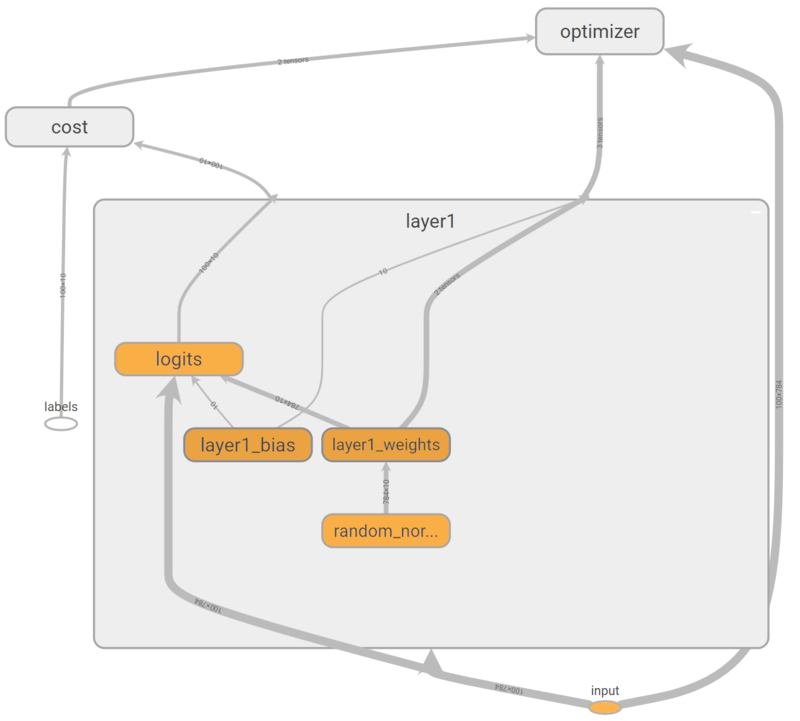 Since every node ends up being a dependency of optimizer and cost, this means that every operation in our TensorFlow graph is executed with every call to session.run(). Our computational graph with only dependencies of logits highlighted in orange. Note: As labels is not one of the dependencies of logits we don’t need to provide it. Understanding the dependencies of the computational graphs we create is important. We should always try to be aware of exactly what operations will be running when we call session.run() to avoid accidentally running the wrong operations. We have defined these tensors to have a 2-D shape of precisely (100, 784) and (100, 10). This restricts us to a computational graph that always expects 100 images at a time. What if we have a training set that isn’t divisible by 100? What if we want to test on single images? Now we can pass in batch sizes of 1, 10, 283 or any other size we’d like. From this point on, we’ll be defining all of our tf.Placeholders in this fashion. Applying tf.nn.softmax() to logits gives us these desired properties. For more details on softmax, watch this video by Andrew Ng. The second line takes the argmax of our predictions and of our labels. Then tf.equal creates a vector that contains either True (when the values match) and False when the values don’t match. Finally, we use tf.reduce_mean to calculate the average number of times we get the prediction correct for this batch. We store this result in accuracy. Now that we better understand TensorFlow graphs, shape and have a metric with which to judge our algorithm, let’s put it all together to evaluate our performance on the test set, after training has finished. Note that almost all of the new code relates to running the test set. One question you might ask is: Why not just predict all the test images at once, in one big batch of 10,000? The problem is that when we train larger networks on our GPU, we won’t be able to fit all 10,000 images and the required operations in our GPU’s memory. Instead we have to process the test set in batches similar to how we train the network. So we’re getting a test accuracy of ~60%. This is better than chance, but it’s not as good as we’d like it to be. In the next post, we’ll look at different ways of improving the network. Over the next few posts, we’ll build a neural network that accurately reads handwritten digits. We’ll go step-by-step, starting with the basics of TensorFlow and ending up with one of the best networks in the ILSCRC 2013 image recognition competition. The MNIST dataset is one of the simplest image datasets and makes for a perfect starting point. It consists of 70,000 images of handwritten digits. Our goal is to build a neural network that can identify the digit in a given image. TensorFlow makes it easy for us to download the MNIST dataset and save it locally. Our data has been split into a training set on which our network will learn and a test set against which we’ll check how well we’ve done. We’ll start by creating the simplest possible computational graph. Notice in the following code that there is nothing that touches the actual MNIST data. We are simply creating a computational graph so that we may later feed our data to it. For first-time TensorFlow users there’s a lot to unpack in the next few lines, so we’ll take it slow. Before explaining anything, let’s take a quick look at the network we’ve created. Below are two different visualizations of this network at different granularities that tell slightly different stories about what we’ve created. Left: A functional visualization of our single layer network. The 784 input values are each multiplied by a weight which feeds into our ten logits. Right: The graph created by TensorFlow, including nodes that represent our optimizer and cost.The first two lines of our code simply define a TensorFlow graph and tell TensorFlow that all the following operations we define should be included in this graph. Next we use tf.Variable to create two new nodes, layer1_weights and layer1_biases. These represent parameters that the network will adjust as we show it more and more examples. To start, we’ve made layer1_weights completely random, and layer1_biases all zero. As we learn more about neural networks, we’ll see that these aren’t the greatest choice, but they’ll work for now. After creating our weights, we’ll combine them using tf.matmul to matrix multiply them against our input and + to add this result to our bias. You should note that + is simply a convenient shorthand for tf.add. We store the result of this operation in logits and will consider the output node with the highest value to be our network’s prediction for a given example. Now that we’ve got our predictions, we want to compare them to the labels and determine how far off we were. We’ll do this by taking the softmax of our output and then use cross entropy as our measure of “loss” or cost. We can perform both of these steps using tf.nn.softmax_cross_entropy_with_logits. Now we’ve got a measure of loss for all the examples in our batch, so we’ll just take the mean of these as our final cost. The final step is to define an optimizer. This creates a node that is responsible for automatically updating the tf.Variables (weights and biases) of our network in an effort to minimize cost. We’re going to use the vanilla of optimizers: tf.train.GradientDescentOptimizer. Note that we have to provide a learning_rate to our optimizer. Choosing an appropriate learning rate is one of the difficult parts of training any new network. For now we’ll arbitrarily use 0.01 because it seems to work reasonably well. Now that we’ve created the network it’s time to actually run it. We’ll pass 100 images and labels to our network and watch as the cost decreases. The first line creates a TensorFlow Session for our graph. The session is used to actually run the operations defined in our graph and produce results for us. The second line initializes all of our tf.Variables. In our example, this means choosing random values for layer1_weights and setting layer1_bias to all zeros. Next, we create a loop that will run for 1,000 training steps with a batch_size of 100. The first three lines of the loop simply select out 100 images and labels at a time. We store batch_images and batch_labels in feed_dict. Note that the keys of this dictionary input and labels correspond to the tf.Placeholder nodes we defined when creating our graph. These names must match, and all placeholders must have a corresponding entry in feed_dict. Finally, we run the network using session.run where we pass in feed_dict. Notice that we also pass in optimizer and cost. This tells TensorFlow to evaluate these nodes and to store the results from the current run in o and c. In the next post, we’ll touch more on this method, and how TensorFlow executes operations based on the nodes we supply to it here. What is the accuracy of our trained network? How do we know when to stop training? Was 1,000 steps enough? How can we improve our network? How can we see what its predictions actually were? We’ll explore these questions in the next few posts as we seek to improve our performance.